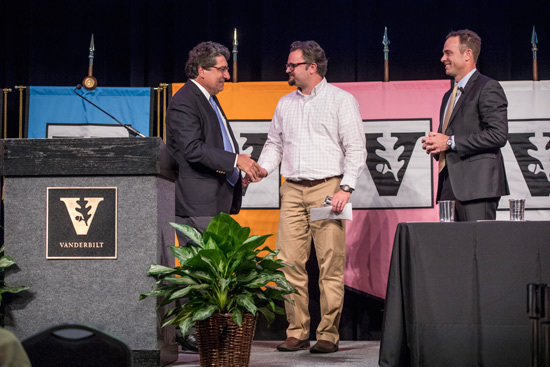 Vanderbilt’s most prestigious faculty award for accomplishments in research, scholarship or creative expression was given to Larry Bartels during Fall Faculty Assembly. 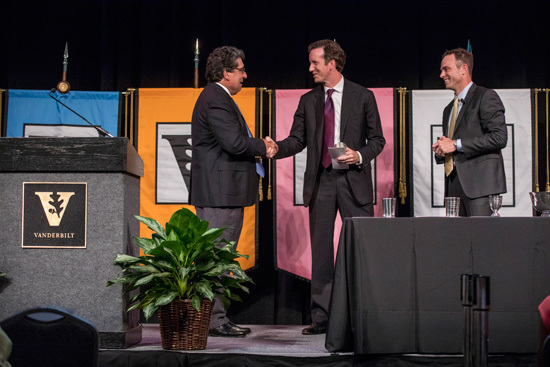 Bartels, the May Werthan Shayne Professor of Public Policy and Social Science and co-director of the Center for the Study of Democratic Institutions at Vanderbilt, received the Earl Sutherland Prize for Achievement in Research. 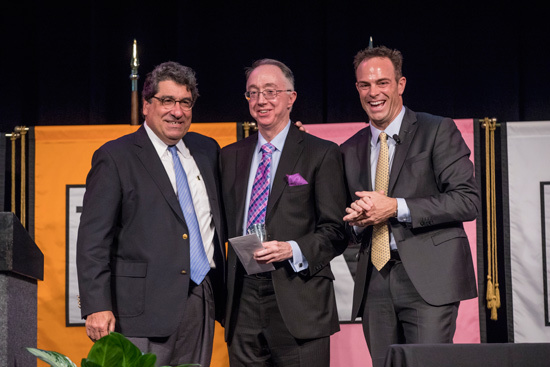 “Larry is highly regarded as one of the world’s foremost scholars of American democracy,” said Chancellor Nicholas S. Zeppos Aug. 24 at the Student Life Center. Zeppos cited two books Bartels has published since his arrival at the political science department in 2011, Unequal Democracy: The Political Economy of the New Gilded Age and Democracy for Realists: Why Elections Do Not Produce Responsive Government. The award was accompanied by a cash prize of $10,000 and an engraved pewter julep cup. His name will also be engraved with the other Sutherland Award winners on a silver bowl that Bartels will possess for one year. 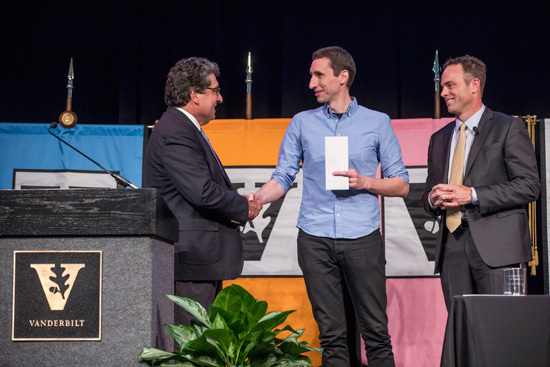 Bartels was one of nine award recipients during Fall Faculty Assembly. The others were Tony Capra, René Gifford, Jason Grissom, Evelyn Patterson, Ganesh Sitaraman, Jason Valentine, Morgan Ricks and Richard Willis. 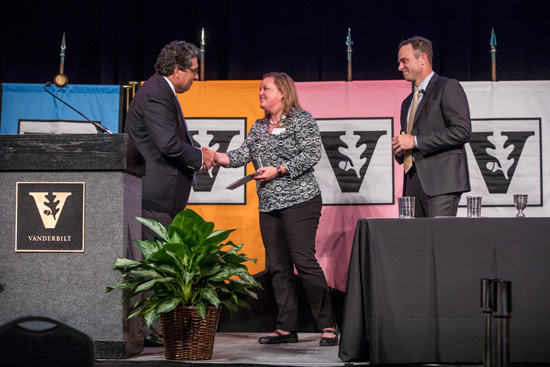 Members of the faculty with 25 consecutive years of service also were recognized and will receive a chair with the Vanderbilt logo and a brass plate engraved with their name. 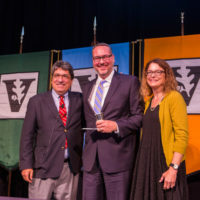 Richard Willis received the Thomas Jefferson Award for distinguished service to Vanderbilt through contributions as a member of the faculty in the councils and governance of the university. Willis holds the Anne Marie and Thomas B. Walker Jr. Chair of Accounting at Vanderbilt’s Owen Graduate School of Management. 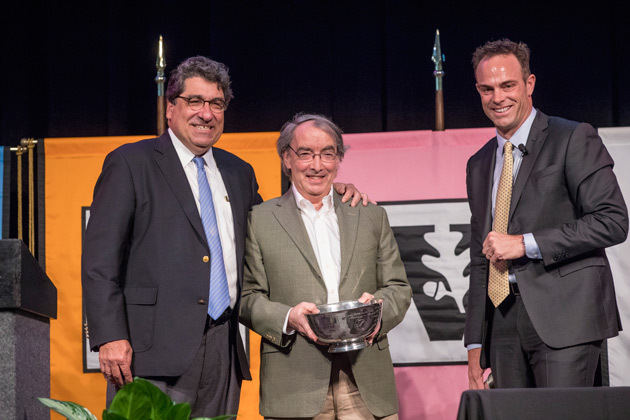 The Thomas Jefferson Award is accompanied by $5,000 and an engraved pewter goblet. Jason Grissom, associate professor of public policy and education, for his research showing that black students taught by non-black teachers are significantly less likely to be referred to gifted programs. The Atlantic published a prominent article based on Grissom’s research. 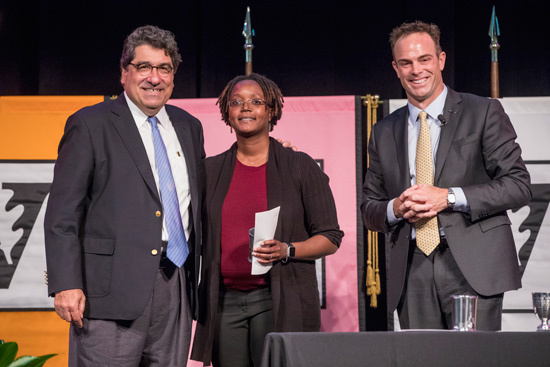 Evelyn Patterson, professor of sociology, for her work on the unrecognized ways in which racial disparities affect incarcerated African Americans. Patterson’s research was published in a series of articles in 2015 and 2016. 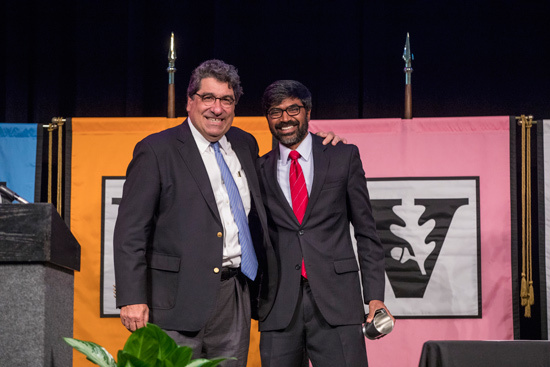 Ganesh Sitaraman, professor of law, for his book The Crisis of the Middle Class Constitution, in which he argues that income inequality is a constitutional issue and that the Constitution assumes relative income equality among Americans. 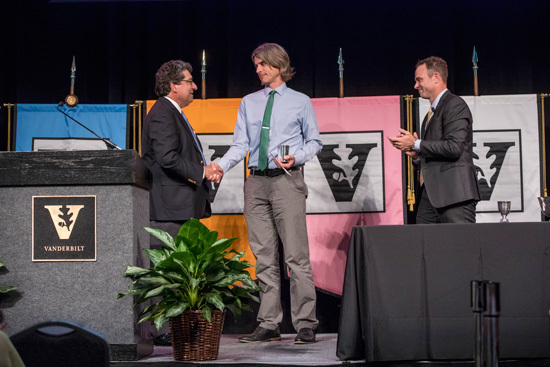 Jason Valentine, associate professor of mechanical engineering, for his work as published in Nano Letters in which he made a major advance in the design of optical metamaterials. René Gifford, professor of hearing and speech sciences, for innovative research on the design of cochlear implants that demonstrated that implant recipients with low-frequency hearing preservation have access to inter-aural time difference cues. Gifford’s work has been recognized by the American Speech-Language-Hearing Association, and she was featured on the first episode of NPR’s Breakthrough: Portraits of Women in Science. Tony Capra, assistant professor of biological sciences, for his article in Science that illuminates the differences in Homo sapiens’ genomes that biologically differentiate humans from other primates. Morgan Ricks, professor of law, for his book The Money Problem: Rethinking Financial Regulation, in which he explores the causes of the 2007–2009 financial collapse and suggests measures that can guard from it happening again in the future.